secret show at Canton Coop on Friday, March 9th. 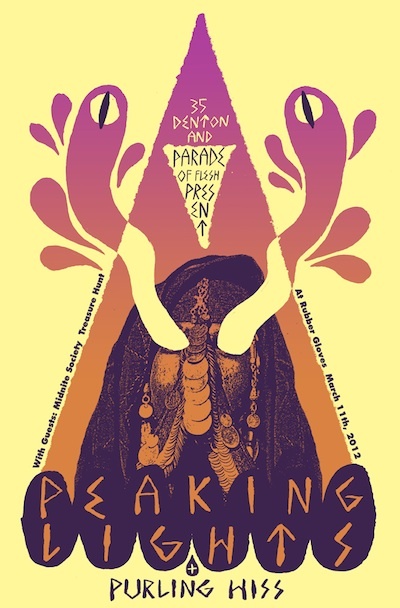 and finally on Sunday, we have our showcase at Rubber Gloves for 35 Denton w/ Peaking Lights & Purling Hiss, Midnight Society & Treasure Hunt. Here’s my pretty rad showcase at 35 Denton!!! Featuring Madison, WI psychedelic duo PEAKING LIGHTS,who blew people away in 2011 with their synthesizer and guitar LP 936 (not not fun). Philadelphia psychedelic-noise rock trio PURLING HISS have come through town in the past with Kurt Vile and in October with The War on Drugs. Midnite Society from Denton are on the bill too!! along with solo electronic artist Treasure Hunt who is usually accompanied with really offensive and entertaining visuals. Artwork designed and printed by illustrator James Heimer. Free poster if theyre any left.. first come first serve. DOS ticket is $20… I know!! so you need to just get a day pass or wristband before they sellout. This entry was posted on March 6, 2012 at 11:00 am, filed under News and tagged 35d, canton coop, junius, midnite society, obrother, peaking lights, purling hiss, rubber gloves, treasure hunt, true widow.